Dr. Robert Kendall (12/29/31 - 12/15/02) founded ALZETA® Corporation in 1982, with a commitment to providing advanced combustion-based products with superior performance and the lowest pollutant emissions. Dr. Kendall launched ALZETA with technology rights to the Pyrocore® ceramic fiber matrix burner technology and a number of development and demonstration contracts with Gas Technology Institute (formerly GRI). His team of experienced managers and combustion engineers focused on premix, surface combustion burner solutions for low NOx applications. Early sales were for applications which included residential heating, commercial cooking, industrial hot water and steam generation and refinery process and tank heating. Major customers included: Esso, Amgen, Chevron, Kentucky Fried Chicken, Luz International, PG&E, Rockwell, and Unocal. 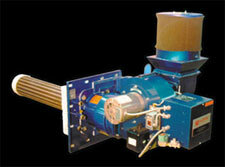 As the company grew and matured, other burner technologies and products were added. In 1988, applying unique metal fiber technology, ALZETA introduced Pyromat™ burners, which immediately gained wide-spread international use in the paper industry for direct radiant drying. Metal fiber burner development continued with the introduction of the proprietary, low NOx CSB that is used today in commercial and industrial process heating and steam generation.